Global capacity for production of liquid hydrocarbon fuels is immense -- far beyond what was imagined by Hubbert or any of his peak oil cohorts. To produce most of those hydrocarbons, humans will need to create improved technologies from scalable high temperature nuclear reactors to improved mining and drilling robots to improved exploration technologies. Political will is every bit as important as technological advances. Policies of energy starvation under European, US, Australian, Japanese, and other governments tend to slow down energy exploration and production in those countries. Political corruption and policies of neglect of oil production technologies tends to slow down production in Russia, Venezuela, Iran, and many oil producing African nations. The largest conventional oil deposits of the world lie under countries that restrict access by international oilcos -- which has the effect of artificially dampening oil production in those countries. In other areas, political and social turmoil lead to sabotage, kidnappings of oil personnel, hijacking of oil shipments, theft of oil, and several other ways in which oil delivery to international markets is artificially reduced and suppressed. The effect of all of this suppression of production is additional elevation of oil prices, beyond other artifactual influences on oil prices. 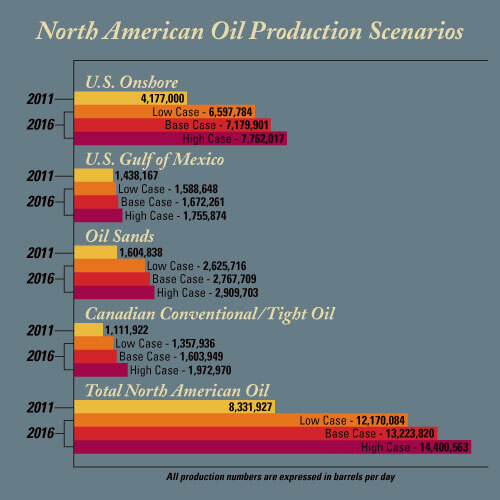 These artificially high oil prices make it more economical for North American producers to expand production in unconventional and marginal oil fields. As long as oil prices stay high, expect to see a ramping up of unconventional oil & gas production in the more politically stable parts of the world. Poor Hubbert: He Just Didn't Know . . .